Many organisations often consider implementing Lean as a vehicle for business improvement but are often indecisive. Not necessarily because they don’t want to, but because they are not certain whether having Lean (and/or Six Sigma) practitioners will deliver the results that they aspire to. Some organisations profess to being “Lean” and others “do” Lean. Contrary to some beliefs, Lean and Six Sigma are not just ‘toolboxes.’ The whole essence of Lean and Six Sigma is to develop a culture (behaviours) that will facilitate sustainable business benefit. 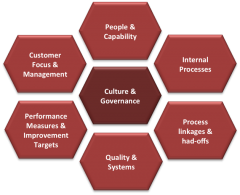 So, how can an organisation judge whether they are, actually “Lean” and if not, what to focus on in becoming a true Lean organisation? Equally, for those organisations that intend to become Lean now, or in the future, how will they be able to determine the size of their challenge? A very successful method of determining whether to embark on a Lean and/or Six Sigma journey is to undertake an Lean Service Assessment across the organisation (or at the least part of it) which will significantly assist in the decision making process. The Lean Service Assessment Tool is designed to help organisations measure how effective and efficient their processes are and to determine the capability of their people in achieving true Lean thinking. If nothing else, it will provide those organisations with a strong indication of their current Lean behaviours and the opportunity to strengthen or indeed start, their journey to excellence. The Lean Service Assessment Tool is a proven and hugely successful method of measuring your current status in Lean thinking and one in which many organisations have utilised to great effect. For your FREE copy of the Lean Service Assessment Tool, just click here and your copy will be on its way to you.